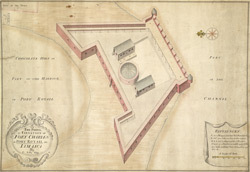 This bird's eye view of Fort Charles in Jamaica was drawn by C. Lilly. Fort Charles was the first fort to be built in Port Royal and was constructed between 1650 and 1660. It was originally named Fort Cromwell but was later renamed Fort Charles. By 1765 it housed a garrison of 500 men and had 104 guns.